A group of 15 to 20 people attacked a campaign stand of the main opposition Republican People’s Party (CHP) in the Hendek district of Sakarya province on Friday, CNNTürk reported. According to the report, the group beat three members of the CHP youth branch who were campaigning for a “no” vote ahead of an April 16 referendum on a constitutional package that will expand the powers of President Recep Tayyip Erdoğan and switch Turkey to an executive presidency. The police detained three people in connection to the incident. Last month, ruling Justice and Development Party (AKP) officials from İstanbul’s Esenler district and workers from the AKP-run Esenler Municipality attacked members of the CHP who were campaigning for the referendum. In a similar incident in February, two members of the CHP were attacked by a father and son during a “no” campaign in the western province of İzmir. 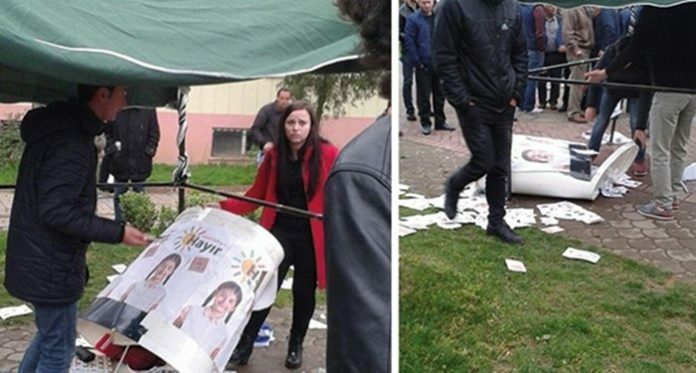 In January, three people from the CHP youth branch in Sakarya’s Serdivan district were battered by an angry mob that chanted “La Ilaha Illallah,” over banners they hung inside a shopping mall. M.D., a member of the CHP youth branch, was shot in January in İstanbul while campaigning against the constitutional amendments. On March 26, Sinan Oğan, a politician who was previously expelled from the opposition Nationalist Movement Party (MHP), was attacked in Yozgat province while campaigning to persuade people to vote “no” in the critical referendum. On March 5, Oğan was also attacked at a private university when he was making a speech against the proposed constitutional amendment package.